Happy hearts day, fashionistas! Today is not only Valentine’s Day, but also the two month mark to our wedding! So my face is literally the heart-eye emoji today. Sean and I are celebrating with a nice dinner but otherwise keeping things low key. Thankfully, we have a long weekend coming up to knock out some planning. It’s down to the fun details—what color napkins, a basket for our flower girl, booking the honeymoon—so I’m doing my best to savor this time, because I know the big day will be here before we know it! Here, I’m sharing an outfit I wore to the Dennis Basso fashion show earlier this week (check Instagram highlights for more), that perfectly suits the day. Tonight, I’m opting for something a little less extravagant, but it’s nice to pretend we’re going to some fancy club that requires a bright red cocktail dress, no? 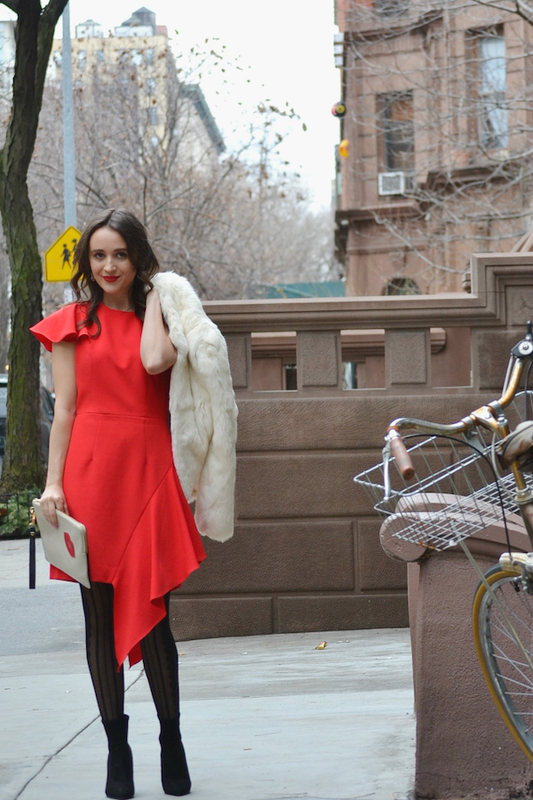 PS: I'm only in the background, but this outfit made an appearance on Man Repeller and it made my whole Fashion Week. That red dress is incredible!! And OH MY GOSH that you are in the background of that photo. To me, you are definitely the star! I've really been loving these fashion week outfits! I can't believe you were in Man Repeller! I adore the red dress here - very V-Day appropriate! Such a pretty dress! So perfect for Valentines day. *jaws dropped* This is a stunning look! Love the colour palette you chose. You look great Annie! Love your furry coat! It looks so comfortable. Thanks for stopping by my blog! I appreciate feedback of all kinds, and LOVE connecting with other bloggers.